This is the playing part: for more on this draft, read on. Let me start by boasting about my home guild, the Weavers' Guild of Rochester. Mind you, Rochester, New York, is not a big city, with maybe one million people in the entire seven-county region. Nevertheless, we have a large and dynamic weaving community. 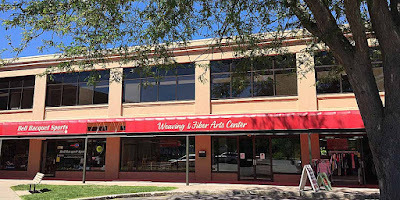 This includes our guild, with nearly 200 members, and our Weaving and Fiber Arts Center, featuring dozens of classes each year in weaving, knitting, felting, dyeing, lace-making, kumihimo, shibori, and lots of other fiber-art techniques. 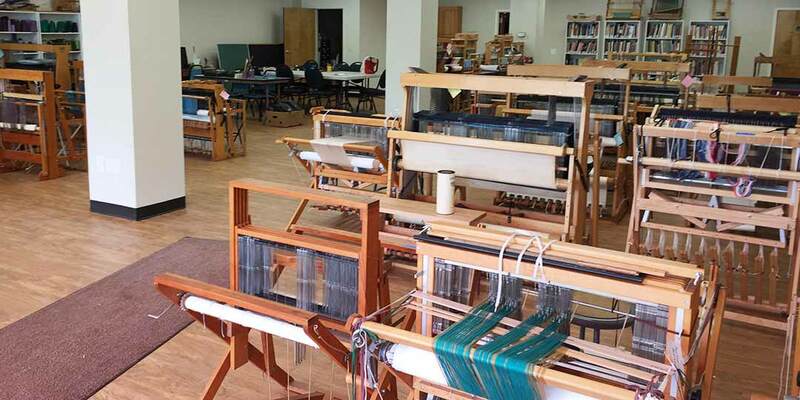 The Center, as it's known, began in a small one-room studio in January 2002 and now includes two spacious rooms, one for dozens of looms and one for off-loom classes and meetings. Here are a couple of photos, to give you an idea. 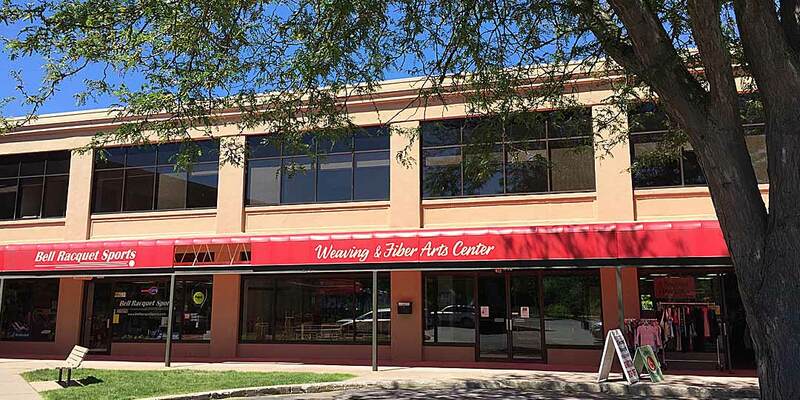 More important are the scores of talented fiber artists who come to learn, create, and share. Give them some tools and some yarn and these folks are good to go! 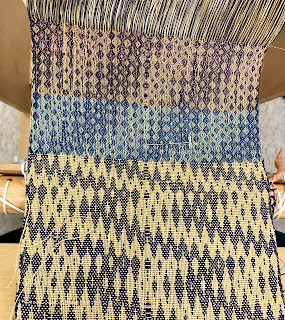 Case in point: Just this past weekend, I taught a workshop there, "One Warp, Many Structures: An Exploration of Extended Parallel Threading." And sure enough, everybody produced skillful, beautiful samples. Here are some photos. 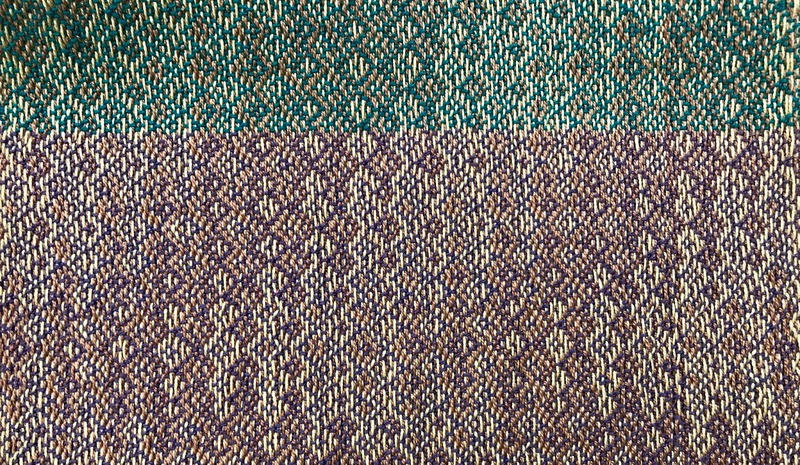 This above is a 12-shaft Echo design woven by Mary Ann Proia on 10/2 cotton with two colors in the warp, terra cotta and sage green, and three different weft colors. My favorite is the blue on the bottom. 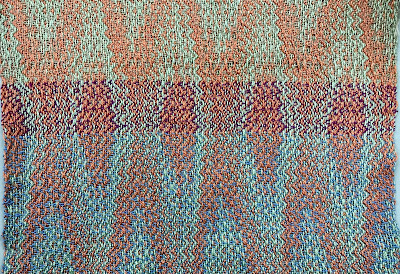 This photo shows the sample after it had been washed, which added texture to the pattern. 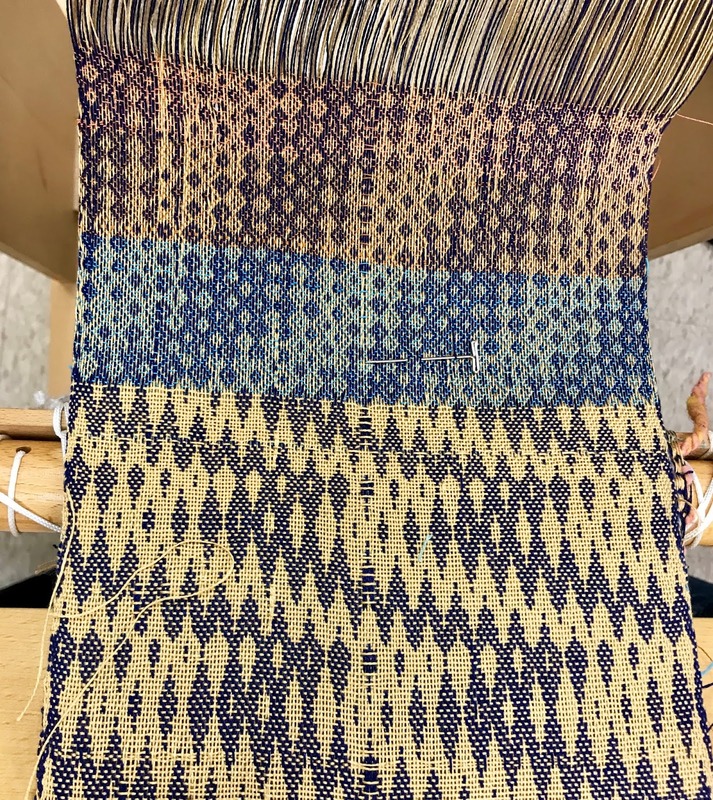 This is an 8-shaft Echo design woven by Marianne Antczak on a warp of gold and beige. 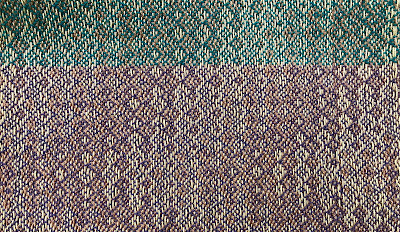 The weft colors changed the appearance of the fabric dramatically: a green weft appears on the top and a soft purple weft is on the bottom. 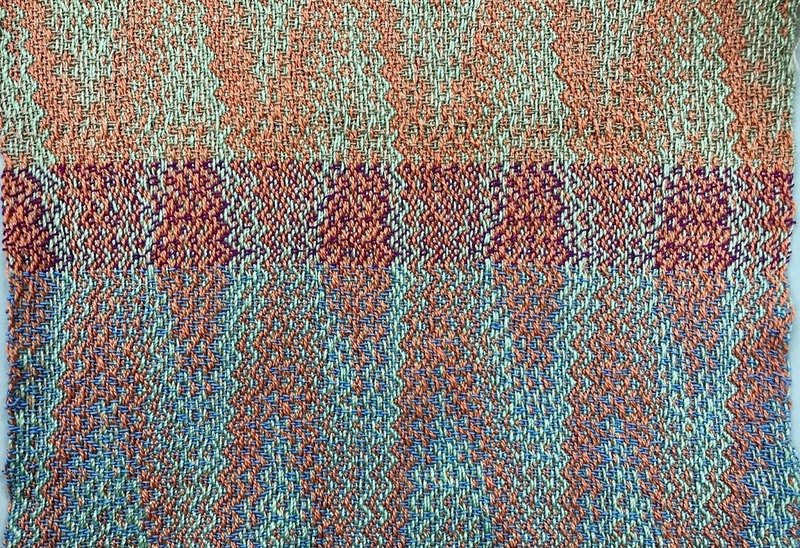 Above is the same 8-shaft design in Echo (top of the photo) and in Double Weave (bottom) woven by Lee Donely. Her warp yarns were also in brown and tan 10/2 cotton. 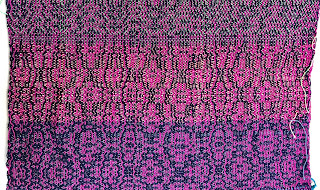 Judy Fox wove a 4-shaft Echo design using fuchsia and black 10/2 Tencel as warp yarns. 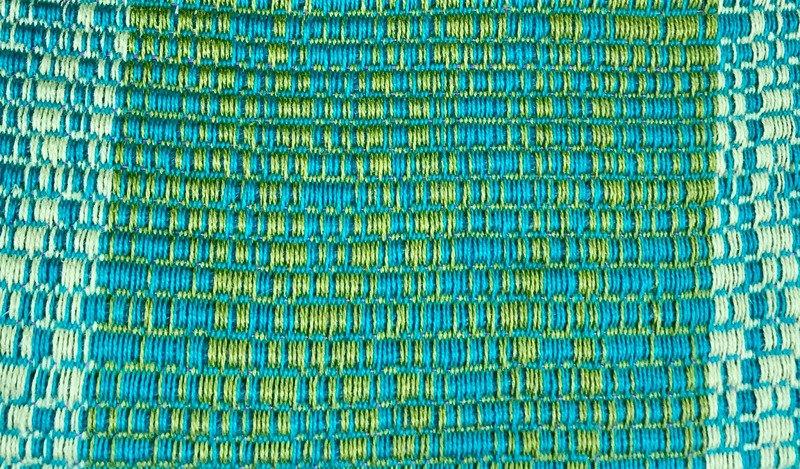 The bottom section uses a turquoise weft and the middle a yellow weft. 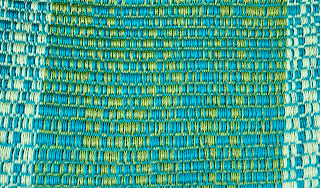 The top portion, seen only slightly, features a Turned Taquete version of the same threading, woven with a green weft. The workshop is designed so that you can weave five structures on the same threading: Echo, Turned Taquete, Shadow Weave, Rep Weave, and Double Weave. 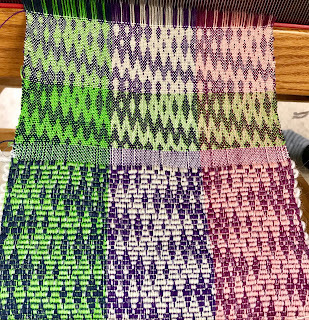 In the photo above, Nancy Kanniainen has woven Rep Weave on a warp of 10/2 cotton. The center section has warps of olive and teal and the outer borders have warps of teal and sage green. 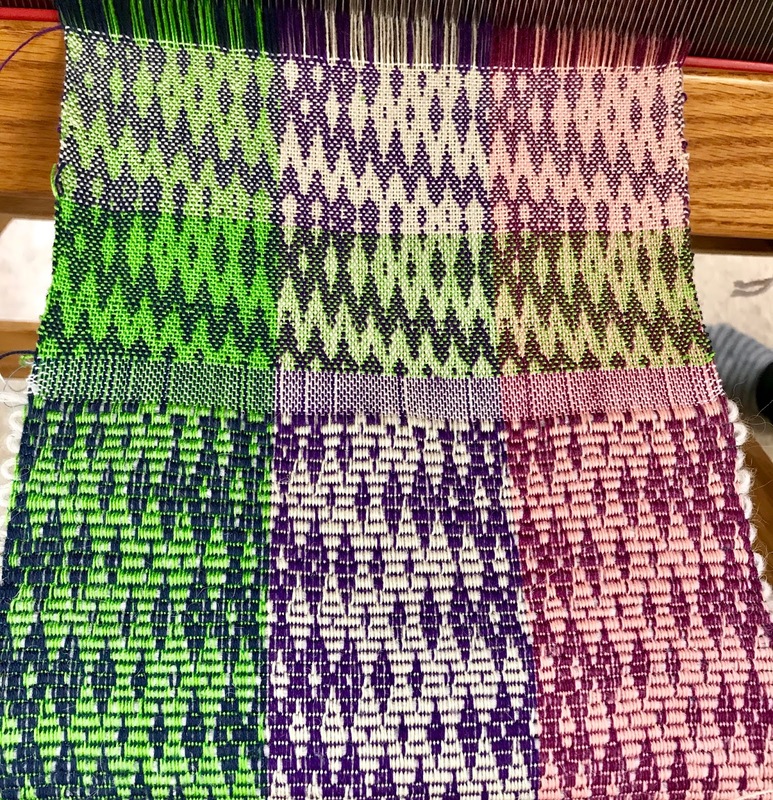 Above, Amy Parker chose three different color sets for her 8-shaft warp: from left to right, green and navy, beige and purple, and salmon and cranberry. The bottom part of the sample is Rep and the top section is Double Weave. And then we got to playing, looking at Marian Stubenitsky's book, Weaving with Echo and Iris. 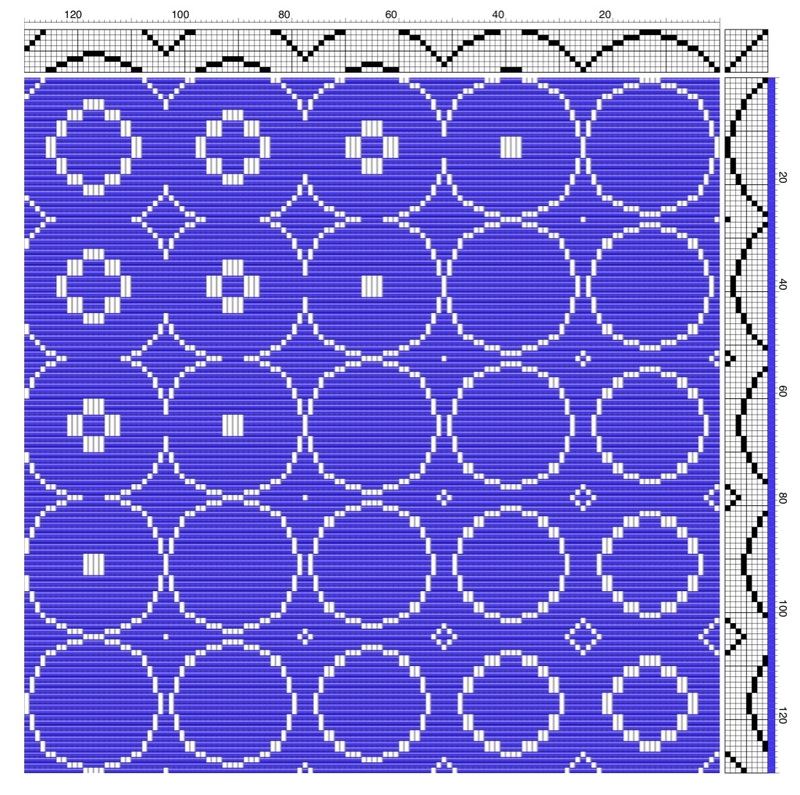 Specifically, we wanted to design a pattern of circles, as she shows on page 96, that called for no more than 10 treadles (the design in the book requires 32 treadles because it's Double Weave). We started with a profile draft. 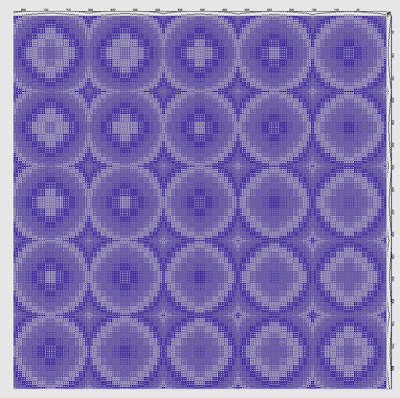 You see the different circle motifs? 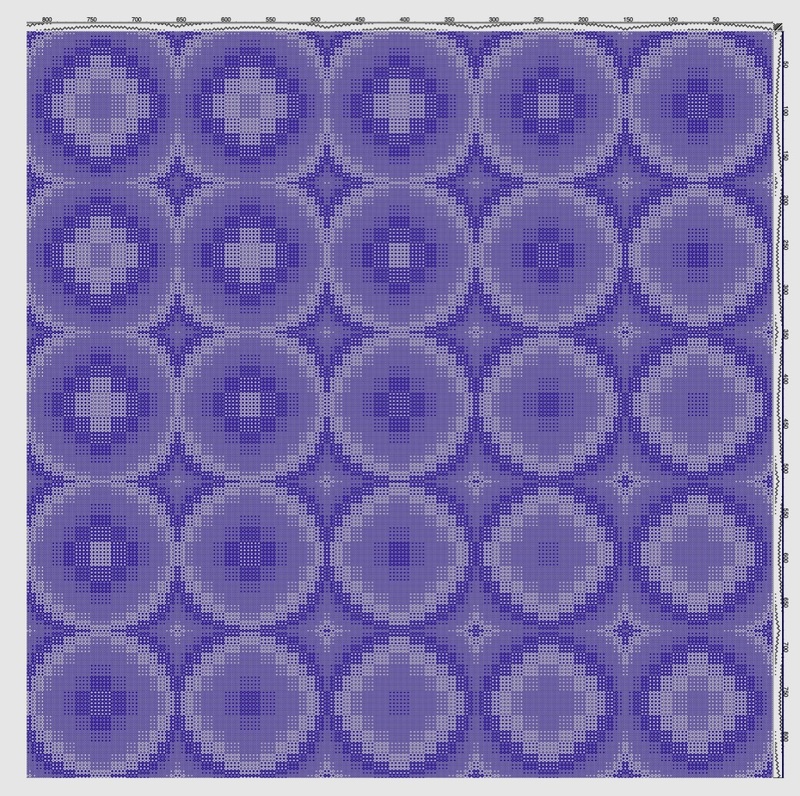 That's because of the advancing repeat, which shifts the threading patterns up. Then we decided to do a simple block substitution using FiberWorks. Under the "Tools" menu, we clicked on "Block Substitution." We chose "Classic Weaves" and then "Crackle -- Twill Form." And with that one click, this is what we got. After changing the warp colors to alternating blue and green (threaded ABABAB, etc.) and then changing the weft color to coral, we had with the colorful design shown at the beginning of this post. Most excellent! We were all very happy! 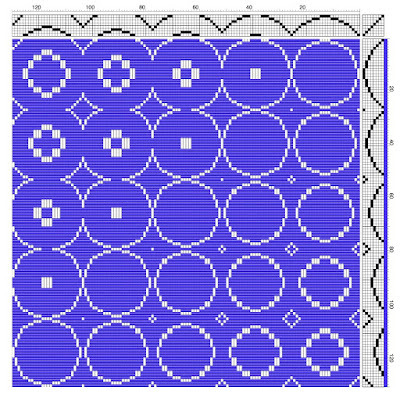 Except for one problem, immediately noted by Debbie Fister: The motifs are HUGE. Each one is about 170 ends wide. 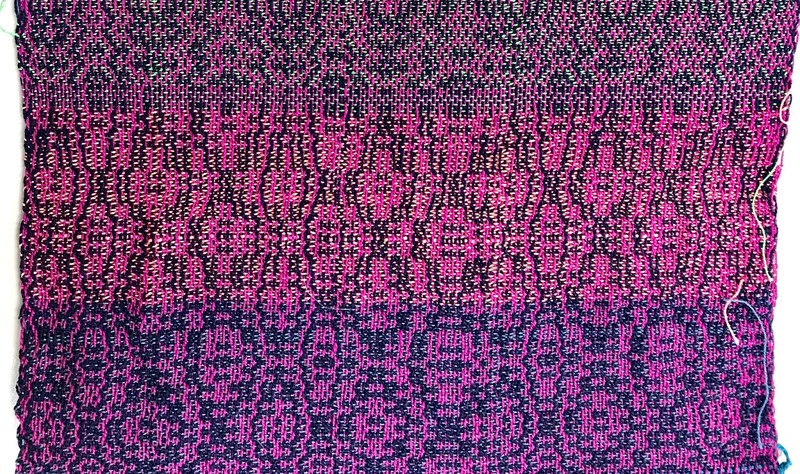 Even if you were threading your loom at 40 epi (not unheard of for 10/2 cotton in an Echo threading), that's more than 4" wide per motif. Something to think about. But that's another story for another time ;o) Thanks for reading!